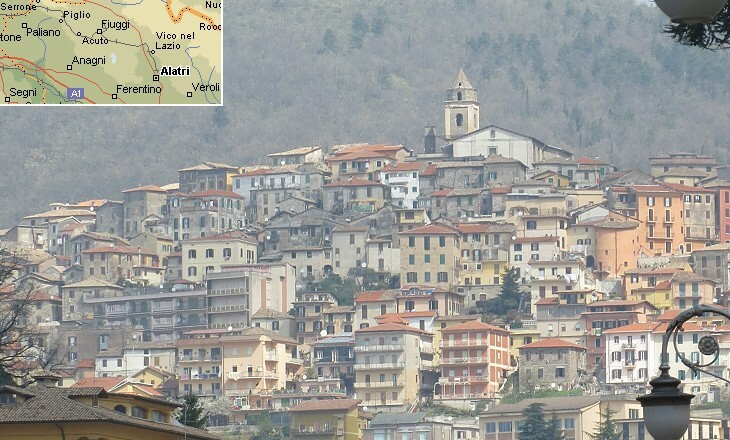 On his way to Alatri Gregorovius noted: The farther we rode, the wilder grew the country (..). Magnificent mountains, hill and dale, and distant peaks unfolded before our eyes. 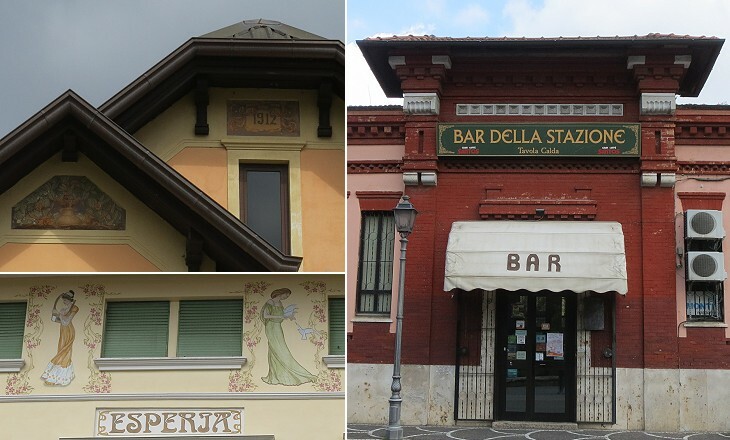 Little white towns could be discerned gleaming from the recesses of the distant Apennines. Gregorovius however did not have time to go across the northern part of the Ernici Mountains which divide the valley of the River Sacco (where Anagni and Ferentino are located) from that of the River Aniene where Subiaco is situated (he did not actually visit Fiuggi). As a matter of fact very few XIXth century travellers ventured to this part of Campagna (the Roman countryside) to see Anticoli (not to be confused with another small town by the same name, where many foreign painters set their residence). Some fifty years after Gregorovius' journey, Anticoli was an entirely different town from that the German writer did not visit. 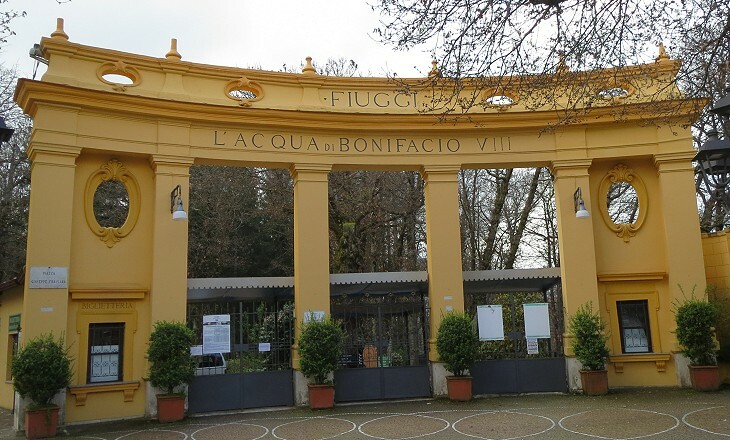 It had become a fashionable spa resort and in 1911 it changed its name to Fiuggi, that of nearby springs, the water of which was said to have been drunk by Michelangelo Buonarroti to heal his kidney stones. The image used as background for this page shows a label off an Acqua della Fonte Fiuggi bottle of water when the town was still called Anticoli di Campagna. In 1905 one of the springs was surrounded with a wooded garden having facilities where visitors could sip glasses of water, while having a chat or listening to music coming from a bandstand. 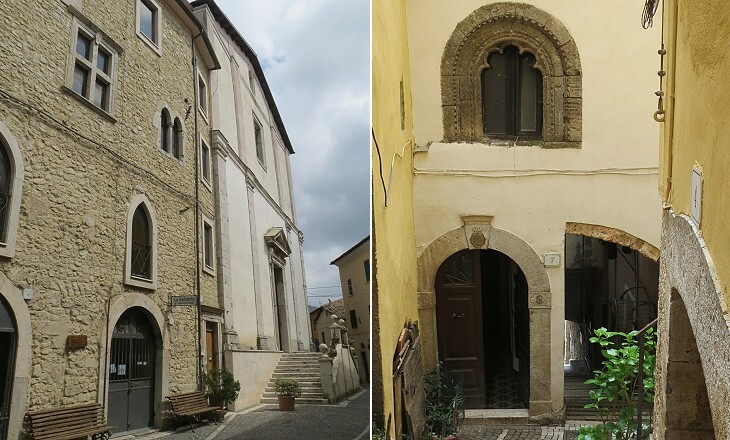 This and a similar facility known as Fonte Anticolana are located at the foot of the hill where the old town (Fiuggi Città) stands and the area around them is known as Fiuggi Fonte. Huge investments were made to attract a rich clientele to Fiuggi. 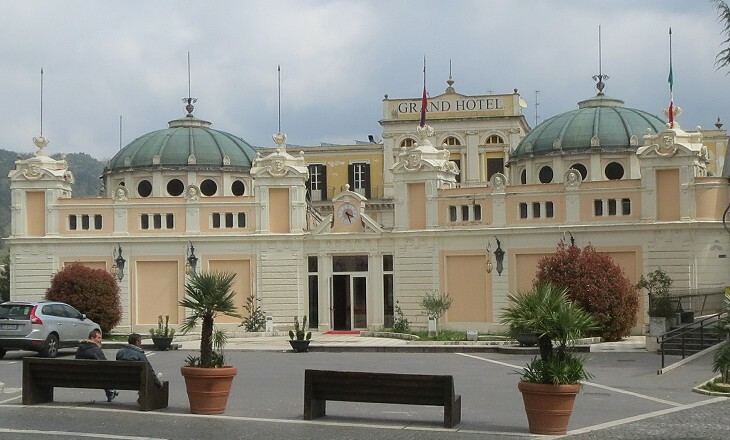 Grand Hotel Palazzo della Fonte was completed in 1913 and in the following year King Victor Emmanuel III of Italy and his family spent two weeks there, so that the hotel management could claim to be "purveyors to his Royal Highness". The middle class who could not afford the big hotels stayed at one of the many pensione which the locals opened by refurbishing their old houses. The development of Fiuggi was favoured by the construction of a railway which directly linked Rome to the town via Genazzano, Piglio and Acuto. It was completed in 1917 and it was accompanied by a motor road. The service was discontinued in 1983. Spas continued to be favourite locations to spend periods of rest and recreation until the 1930s when sea and mountain resorts became more popular. 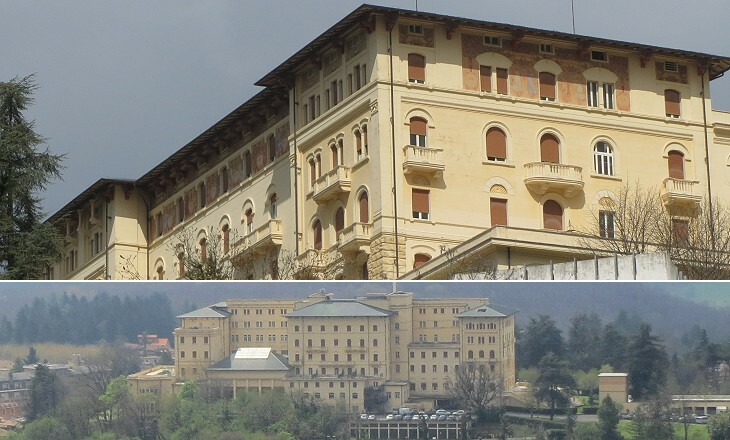 Today Fiuggi can provide sleeping accommodation to some 8,000 guests in May-October when all hotels are open. 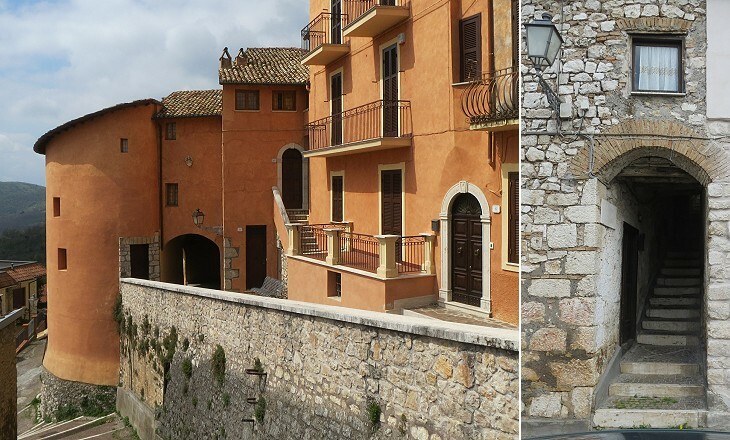 The medieval urban layout of Fiuggi Città is still easily noticeable, although some stone walls were plastered and painted. It could be accessed only through a couple of narrow passages in addition to the main gate which was pulled down in the early XIXth century. Similar to many other towns of the southern part of Latium it was a fiefdom of the Colonna of Paliano, who acquired it in 1517. 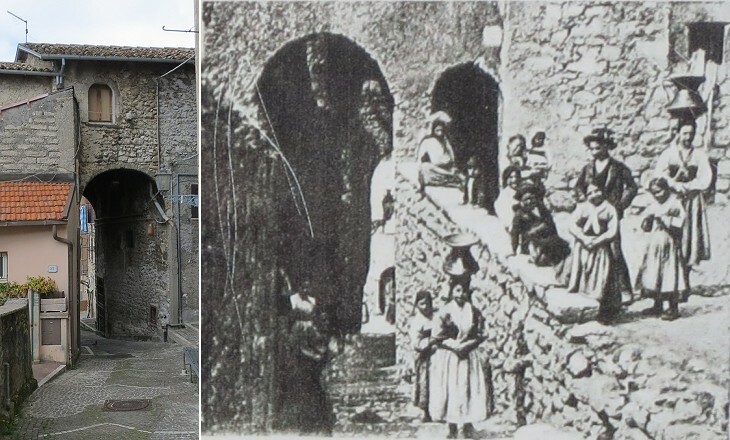 In recent years some old houses have been freed from the plaster by which they were covered in the early XXth century. At that time old stone buildings were regarded as reminders of a historical period when life was very miserable.